Looks like one of the most interesting big cat myths/legends has crumbled. 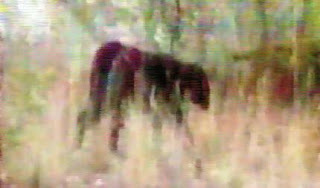 We managed to view what appears to be the frozen body of an animal that was shot within a few kms a couple of months after the whole debacle/circus..and we think that there is about a 99% chance this animal is it. Why didnt the researchers who were on to it quickly just not do one simple thing. Go and stand where the cat was filmed, with some form of height indicator, to give us a relative height in the video.And Just film from the same location. Did they do that..naaggh..too hard. And why did no one mention much about the moggy coloured feral cat that was in the same footage at the start that was virtually the same size as the "panther". When the cat is stuffed we will try and take it back to the same location and film from approx the same spot. We have found that looking up, or down a hill, when filming cats throws off the whole perspective of size. The other thing that confuses witnesses is viewing cats that are fairly long legged which makes them look bigger.Colour them black,place them on a hill and shazzam..a "panther".